On a public road near Coventry, Falstaff nags Bardolph to go buy him some wine. Bardolph exits. Falstaff reflects that he should be “ashamed of [his] soldiers,” for he has abused his role as army captain for his own gain: he has deliberately enlisted (“pressed”) wealthy, cowardly men he knew would never want to fight in the war, and those men have paid-off Falstaff to let other men to take their places. Falstaff’s troops are now full of “the cankers of a calm world and a long peace”: pitiful, old and/or impoverished men, ex-slaves, ex-convicts, young boys, etc. A passerby told Falstaff his troops looked like a bunch of corpses. Falstaff has, unsurprisingly, proved an ineffective military captain. Instead of acting for the good of his army and cause, he has acted for the good of his wallet. Yet, rather than owning up to his selfishness, Falstaff places much of the blame for his weak troops on the consequences of peacetime. A peaceful England has, he claims, softened its population and rendered them inept warriors. Prince Hal and Westmoreland enter and Falstaff is surprised to see them, since he thought they’d already ridden off to the battlefield. They explain that they are on their way, and that Falstaff had better prepare to start fighting soon as well. Falstaff tells them not to worry about him. Prince Hal and Westmoreland express dismay at the “pitiful rascals” making up Falstaff’s troops. “Tut, tut,” Falstaff replies, “food for powder; they’ll fill a pit as well as better….mortal men, mortal men.” Prince Hal and Westmoreland exit, hurrying towards the battlefield. Falstaff exits after them, remarking that “a dull fighter” always enters a war towards the war’s end. Falstaff’s description of his troops is uttered lightheartedly, but it reveals a grimly profound truth about war: indeed, most soldiers are nothing but “food for powder,” mere cogs in the bloody work of battle where the number of soldiers matters far more than any one soldier’s individual identity or worth. Hal’s dismay again suggests an underlying philosophical difference between him and Falstaff, and that he ultimately is closer in his beliefs to his father than he is to Falstaff, even if he enjoys Falstaff’s company and antics. Ross, Margaret. "Henry IV Part 1 Act 4, Scene 2." LitCharts. LitCharts LLC, 18 Jun 2014. Web. 22 Apr 2019. Ross, Margaret. 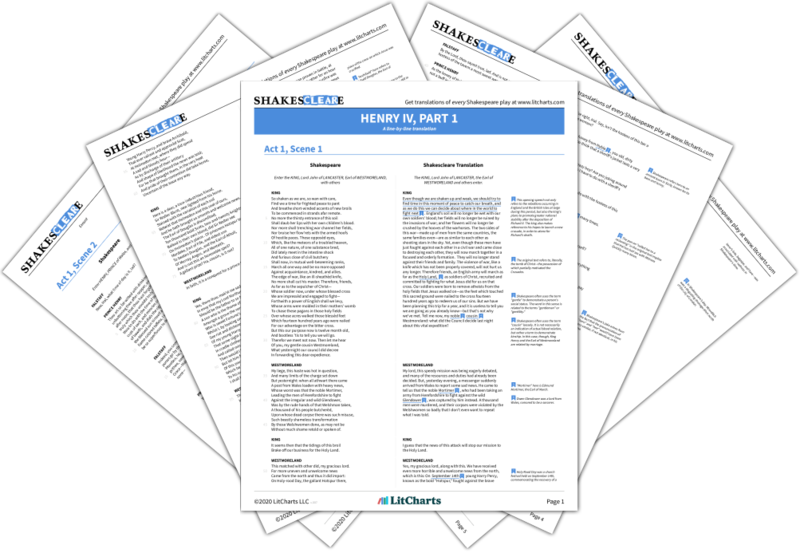 "Henry IV Part 1 Act 4, Scene 2." LitCharts LLC, June 18, 2014. 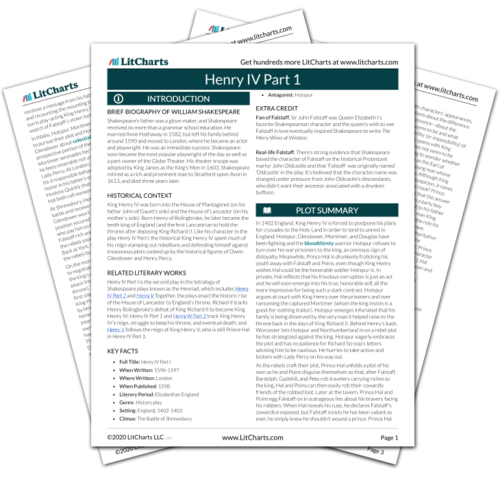 Retrieved April 22, 2019. https://www.litcharts.com/lit/henry-iv-part-1/act-4-scene-2.